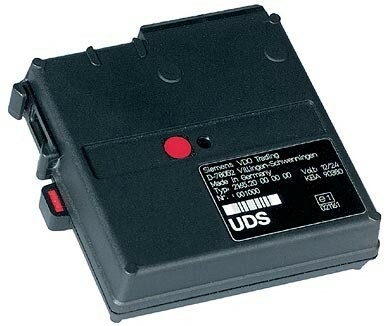 UDS accident data logger offers an effective means of recording accidents and critical driving events. Inside the vehicle, a series of high-precision sensors are used to measure longitudinal and lateral acceleration, as well as any change in direction. The speed of the vehicle is also recorded, along with the use of vehicle systems such as the brakes, indicators and lights, on the basis of over 10 status input. Features record the usage of flashing lights and sirens on emergency vehicles. User can retain an event by simply pressing the UDS button. An intelligent memory management function manages memory remaining. The system is so precise that UDS data can even be used as evidence in court. The UDS is a small black box which anybody can have built into their car. It is usually located under the passenger's seat. In case of an accident this device saves important data from 15 sec before impact until 30 sec after the crash. It memorizes in particular : the use of brakes, signals and lights, longitudinal & traversal acceleration, speedometer reading. This data can be analysed and used by authorised reconstructionists to investigate difficult cases. The processing of this information can often provide answers in cases where an accurate reconstruction would not have been possible without a UDS. The manufacturer of the only UDS to be on the market is the VDO-Kienzle AG, located in Villingen-Schwenningen, Germany. A UDS costs about 600  plus installation and the price for an installation (~ 400 ) depends on the vehicle. In this example C comes to a halt in time behind the rear-end collision of A and B. C is followed by another vehicle D which does not stop in time and collides with C.
This causes vehicle C to be pushed into car B which is standing in front. For the calculation of the liabilities the sequence of the collisions is substantial. Investigating only the damages of the vehicles the reconstructionist will not be able to say whether a car has slid or has been pushed into another vehicle. Usually C could not prove that he/she was absolutely innocent. The innocence can be proved with the aid of an UDS. It memorises that C has already been standing still for a few seconds when an impulse from behind caused vehicle C to collide with B.